What is the New York Best Wings Festival? The festival is a one day event which features wings from different bars and restaurants all over New York. The festival also has a selection of craft beer from all over the United States and plenty of food trucks from surrounding areas. 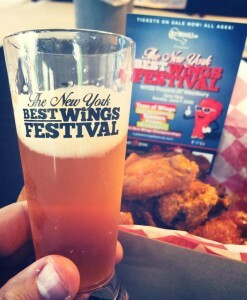 The New York Best Wings Festival is presented by Best Wings Long Island, made possible by two friends on a constant search for the most delicious wings and beer. Now, they want to share their findings with Long Island in this festival. Of course there will be tons and tons of wings from some of your favorite restaurants and bars including Croxley’s Ale House, Joe’s Garage, Matty Smokes Alot BBQ, Tavern on Jane, Wander Inn, Brew Brothers Grille and a lot more. Your mouth will water as you try in house crafted wings of all flavors. There will be three wing eating competitions during the festival, which include Teen Wing Eating Competition, College Wing Eating Competition and the Melt your Face Wing Contest. Vendors will be entered in The Best Wings Championships with categories like Best Buffalo Wings, Best Unique Flavor Wings and the Festival Favorite Award. There will be over a dozen breweries giving you a ton of craft beer options. Whether you like IPAs or ales, you’ll find it at the festival. Long Island favorites like Port Jeff Brewing Company and Montauk Brewing Company will be in attendance, along with Coney Island Brewing Co., Spider Bite, Barrage Brewing Company and many more. There will be plenty of other vendors at the New York Best Wings Festival as well. The kids can have some bounce house fun while you try food like Savannah Jean’s BBQ, Horse Shoe Brand hot sauce, Knot of this World pretzels and much more. Even sample some of Famous Murph’s Bloody Mary Mix. Don’t miss this “AmazeWing” time of fun, food and beer. All Island would like to remind you to stay safe during The New York Best Wing Festival. Whether your belly is too full from wings or craft beer, we can provide transportation for you. Call us at a location near you or make a reservation online.